LTM Concrete set out to build a clever new rebar support but ended up building something revolutionary. We called it “Dually” thinking it would hold rebar at both 2 and 3” heights. We obviously named it too soon… By the time it was finished, we learned Dually would support rebar at seven (7) different elevations, not to mention a number of vertical applications. All told, we’ve found more than a dozen uses for this versatile part. Dually is an entirely unique product that can be used in footings, slabs, walls and even post-tensioning projects. In fact, it serves just about every need a concrete contractor has on-site. Though engineered to use rebar #3-6, Dually actually supports up to #12 when laid down.Its wide base offers stability on uneven surfaces and is strong enough to carry a good, heavy load. Extra-wide openings allow concrete to flow through for extreme support. 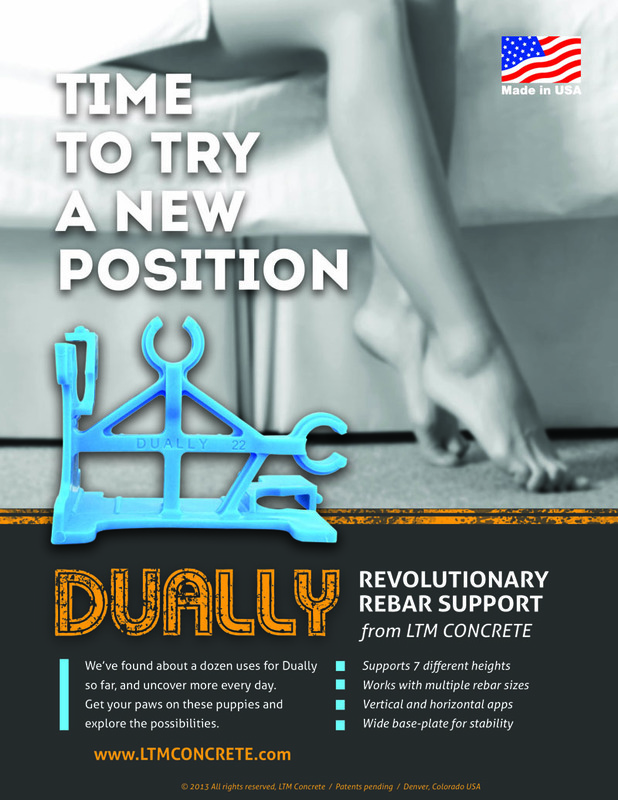 So whether you’re trying to hold a single bar, or a sturdy rebar mesh, Dually is there to help. Best of all, Dually delivers immediate results. Because it does so many things, Dually reduces the number of parts you’ll have to order and inventory, saving you time and money. It also means you’ll haul less gear to the jobsite, cutting down on man-hours and back strain.